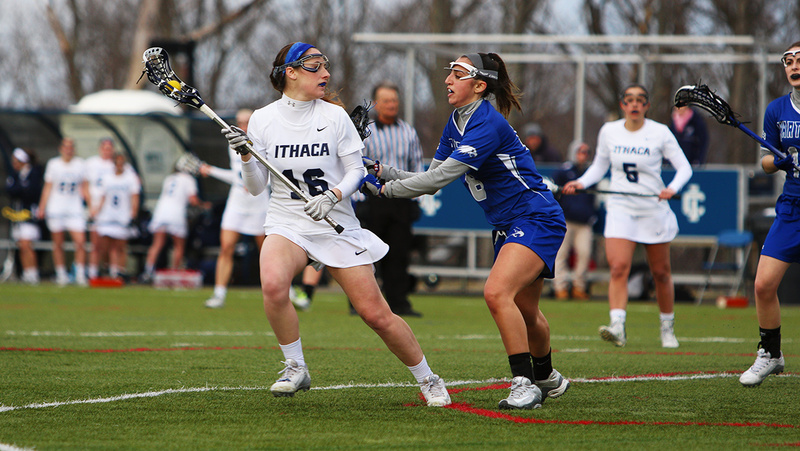 The Ithaca College women’s lacrosse team defeated Hartwick College 16–4 March 8 at Higgins Stadium. With the win, the Bombers improve to 3–0 overall and 1–0 in the Empire 8. With the loss, the Hartwick Hawks fall to 1–1, and 0–1 in the Empire 8. The Blue and Gold took a commanding lead early on. In the first 15 minutes the score was 6–0 due to 4 goals by graduate student Ally Runyon. Hartwick got one back with 17:03 remaining in the first half, after a slick pass from freshman Hailey Pooler to junior Ashley Werner. After the Bombers got the score up to 9-1, the Hawks responded with a goal by junior Megan Young. The South Hill squad would respond a few minutes later, pushing the score up to 10–2, when Runyon got her fifth goal of the match. With just over a minute left before halftime, the Bombers made it an 11–3 game with a goal by senior Morgan Cadwell, finishing the first half. One and a half minutes into the second half, the Bombers increased the score with a goal by sophomore Elizabeth Rice. Cadwell scored her second goal of the game 30 seconds later to make it a 10-point game. With about 20 minutes left in the second half, Rice was called for dangerous play and given a penalty, with Werner sprinting down the field for an easy goal to make it 14–4. The Bombers’ head coach, Karrie Moore, said having a veteran group of players has helped build chemistry on the team. The Bombers return to action against SUNY Brockport at 12 p.m. March 10 in Brockport, New York.